ITS has just installed a video wall at the entrance to Beardsley Hall facing Martin Hall. We view this as an experimental display and hope to figure out how to use digital signage to inform, educate, and possibly entertain. We plan to mix feeds of online content with works created at Swarthmore, such as our ITS Blog, social media feeds, student poster projects, artwork, and short videos. Below a slide show with some examples of possible content. Send your ideas to lmc@swarthmore.edu. 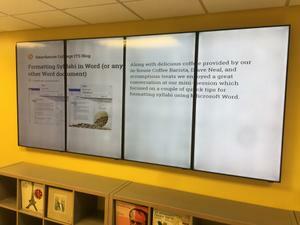 This wall has been put together using consumer monitors and off the shelf hardware. Much more expensive systems exist comprised of frameless video tiles which can be laid out to fit the space. We didn’t want to invest in one of these systems until we have a better sense of how effectively a video wall can engage our community. There’s no end to the options, but there are also plenty of tales of signage gone dark for lack of content, or a coherent message. Stop by and see the wall in action and again send your ideas to lmc@swarthmore.edu. We’ll follow up and discuss things further! Also check out more cool ways in which Digital Displays are being used in commercial, educational and museum settings.